I spent a lovely afternoon in Discovery Park last weekend in Seattle and was surprised to see these babies flourishing so early. I think it's probably early even by north Washington standards. I love the savory, almost meaty flavor of stir fried or simmered nettles. There is a local patch we have been harvesting from for years. But it will be a month and a half before they are sprouting there and I was tempted to pick some last weekend. I don't think they would have fared well on the drive back to MT. Plus I had no gloves and gone are the days when we used to harvest them for hours with naked hands in the throes of an embarrassing idyll. We thought we should allow the plants to envenomate us as a means of deepening our relationship with those nutritive leaves. This would lead to numbness in parts of our hands that sometimes lasted up to 2 weeks. It seems the plant is coming into its own as a popular food source. 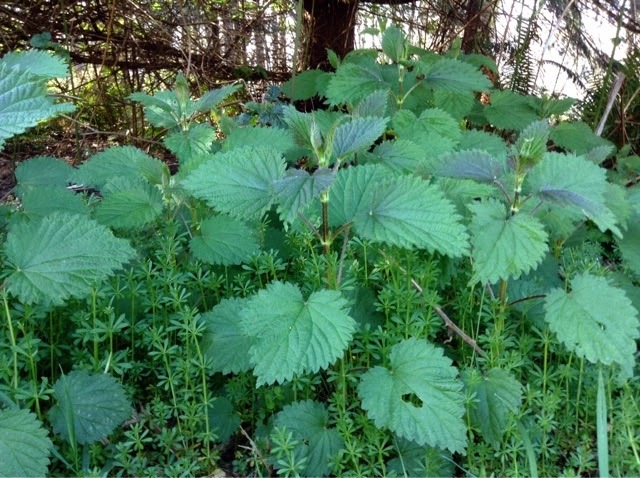 In a recent food magazine I saw that someone has started a web-order nettle operation. Aside from parts of the desert Southwest, it is hard to think of areas of the U.S. where you can't find some species of wild nettles growing. I was impressed by the abundance in Seattle. It's a bit more challenging to find a good patch in arid MT.